Congrats LM your putting them down! Way to go Clay and Jeff! 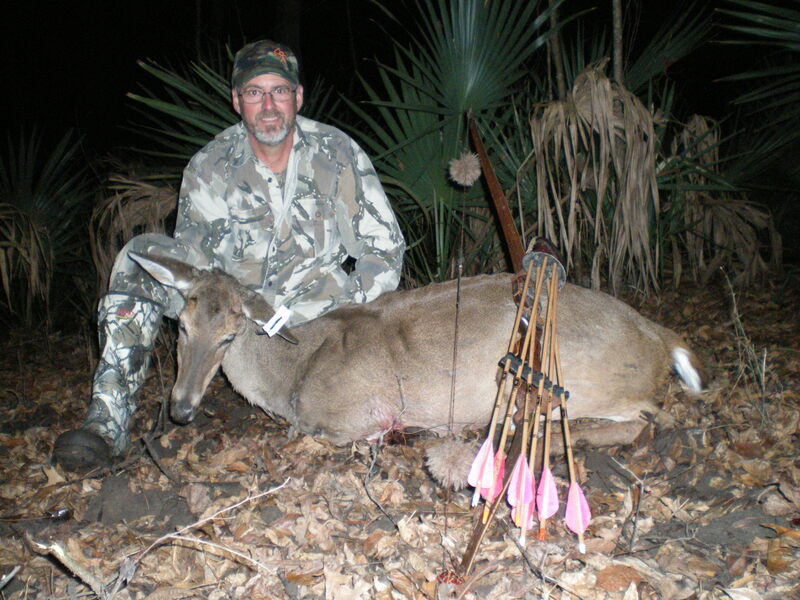 Shot this doe on North Louisiana Public Land. She came in to a Nutall oak that was still dropping a few acorns. Had a huge 8pt was coming in but got my wind at 60 yards. Palmer Longbow 47#@26” 64” amo. Goldtip 3555 shaft with Dirtnap 125gr head, 500 total grains of arrow weight. Congrats on a good lookin doe Ghost! Man, y'all are kicking off 2018 in fine fashion. Wackin & Stackin. 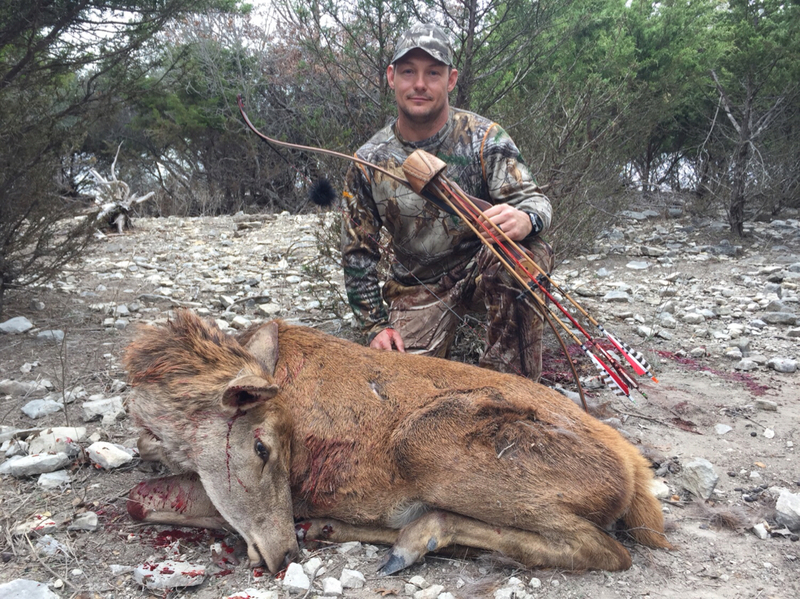 Congrats bow hunters. Way to SwampGhost!! Congrats on some fine shooting sir. Swamp ghost, could you get that pic a little bigger I may have missed a tick behind her ear? Just got caught up, Good shootin fella's! Congrats all the way around! Nice shooting, looks like you're dialed in Cepperson. Congratulations clay. I really have to find time to get after some porkers. 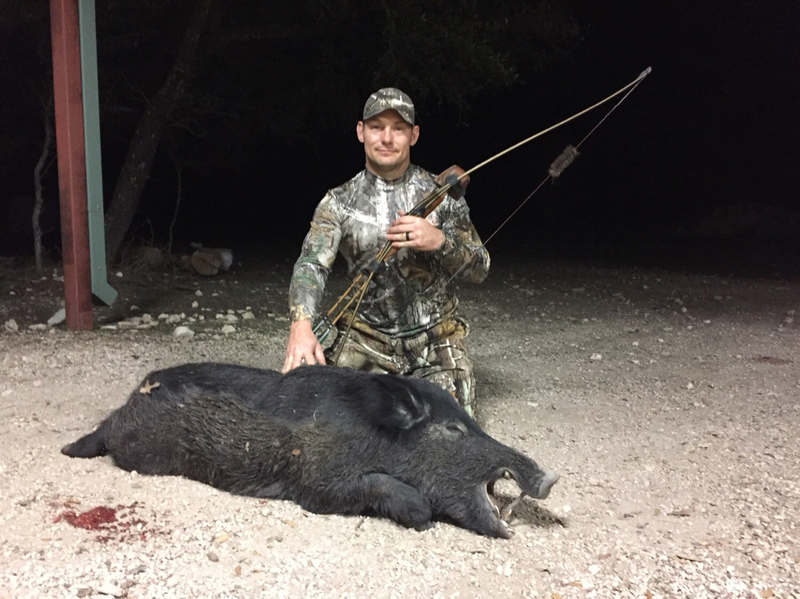 I finally get to participate, got a nice eating sow at Fowler Ranch last Saturday. Got her with my new Sarrels Sawtooth. Frankie’s place is always fun! Good shooting Jason. Nice pig. Way to go Jason! I was wondering if you were using one of your trad bows when I saw your posts on Facebook. Thanks, yes up until the last morning, then I had to break out my compound to get my red hind. Really didn't want to, but I was running out of time and they were hanging out past my comfort zone. Critter #2 for the year! I have not been a fan of the Magnus Stingers in the past but I have to say this was one of the best blood trails I have ever seen! Last edited by Featherflinger; 02-02-2018 at 10:17 PM. 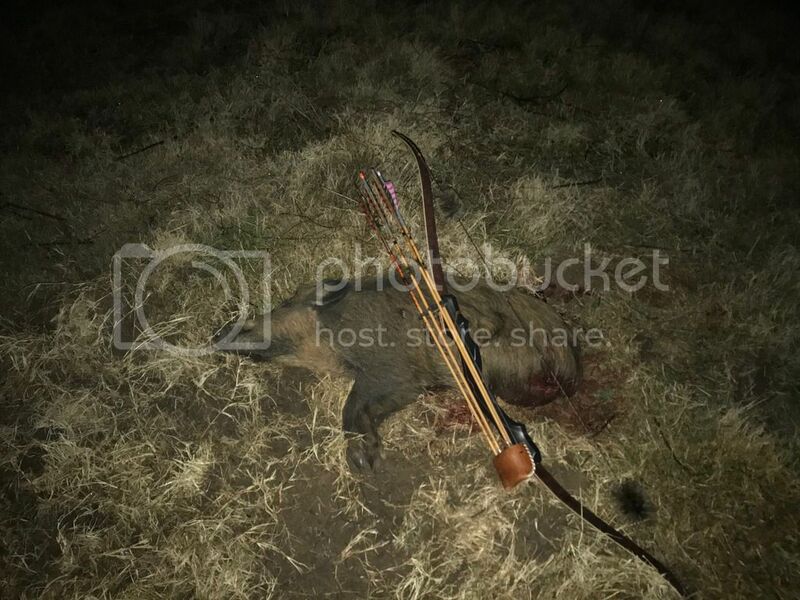 Dang fine hog and blood trail! Nice pig. Way to go! Nice one Jeff! I have got to get after some pigs!!! 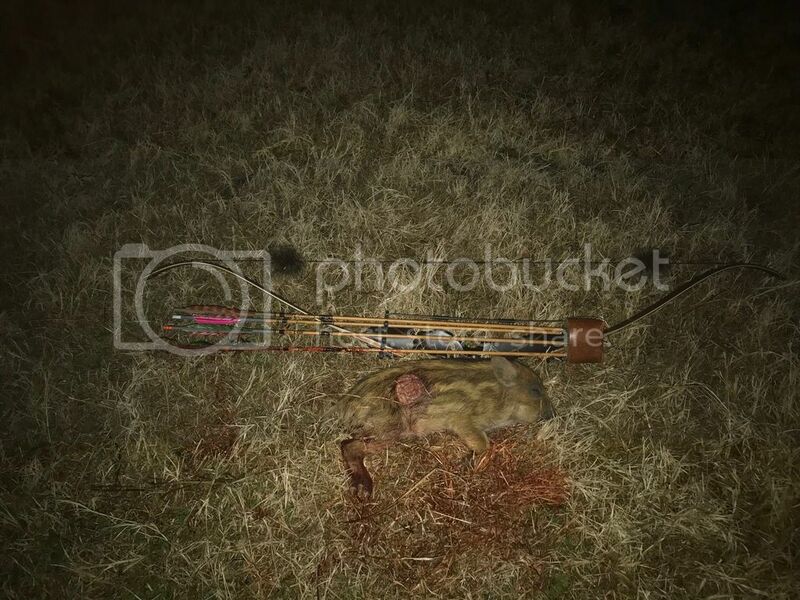 I'm on board with my very first trad kill. I'm like a danged little kid. I'm out chasing javi but this little target of opportunity appeared. I didn't have any small game heads so I made a blunt by wrapping Rescue Tape around a field point. He was only at 6 yards but thanks to the FSC a couple of weeks ago I knew how to aim for that close a shot. I aimed for the head and hit right behind the ear. DRT. Lol! He ain't a P&Y but he's mine. Awesome Geezy! Some great eating there as well. Congratulations! Way to go Geoff! Now go get one of those stinky javies!!!!! Now you’re hooked, way to go Goeff. I'm trying but getting close enough has been tricky. I haven't been able to get inside of 30 yards. Easy shot with the wheelie but I'm bound and determined to git r dun with the recurve. Put me down for a few more. Had a great weekend at Fowler Ranch. Got it done. Good shooting. Find More Posts by Jack S.
Way to go Jeff! Frankie’s place is a great one to kill stuff! WAY TO JEFF!! That is some really good shooting. Congrats to all on some fine animals. Helluva nice blackbuck. Congratulations on the kills.